We were going to head to the Biodome in Montreal this past weekend, but when we checked the website just before leaving, we found out it's closed indefinitely due to a strike. Close call, there! We did make it to the Museum of Nature a couple of weeks ago and it's wonderful. Chantal already did a great job covering it for KITC but I wanted to add that the crowds have thinned out - we went on a Saturday morning and it was pleasantly quiet - and also that they have a fantastic display on right now about frogs that is super cool. And now, to the changing of the guard. 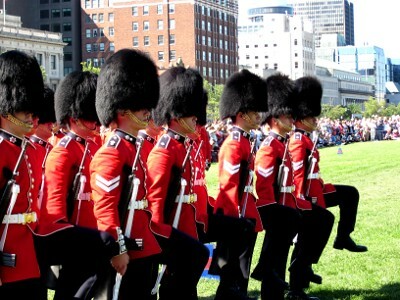 We were headed downtown for the Busker Festival (great for kids, by the way - if you missed out, book it on your calendar for next year's Civic holiday weekend), and so we thought we'd catch the changing of the guard on Parliament Hill first. I was amazed when we took the kids to the Hill last year - they actually really enjoyed it. We didn't do the tour, but the kids loved running around on the huge lawn, checking out the Centennial Flame, going up the tower (there's a separate line for that, you don't need to be on a tour to go up), checking out the cats and the view from the back of the building, and imagining all sorts of princesses and knights that live in "the castle." So adding really cool soldiers, pipers, and marching to the mix should only make it even better, no? The kids were pretty excited for about three minutes. They liked the drums and the bagpipes and the marching in formation. The entrance parade, where they march up Wellington from Elgin street, captured their attention. But what came next was about 30 minutes of standing around. There was occasional unexplained shuffling, and the odd yelling of unintelligible orders. A few bigwigs walked up and down, inspecting the bayonets and guns. It was pretty low key, to say the least. After about 10 minutes, our kids were either asking for a snack, asking to leave, or poking the kid next to them. After about 20 minutes, they were all begging to go home. By the end, seven-year-old was swearing up and down that he was NEVER coming to this event again. It sure does make for pretty pretty pictures, though. 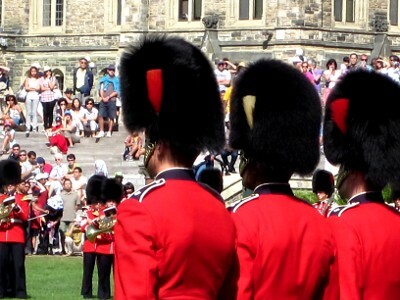 So overall, although Parliament Hill itself is a big hit with the kiddies, the changing of the guard was a flop. Not only were the kids bored witless, I had to deal with my husband telling me, "I told you so!" about 50 times. Gah. 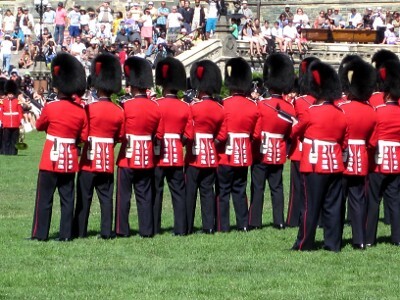 The changing of the guard takes place on Parliament Hill every day in the summer at 10 a.m., up until August 27. My kids are young and fidgety, but you might be able to sell this event to kids that are more 10 to 12 years old, and more interested in Canadian history. If you do have older kids and decide to give this a go, be sure to arrive at least 15 minutes early, as two guides will give an English and French description of what the changing of the guard means, and what is going to happen. 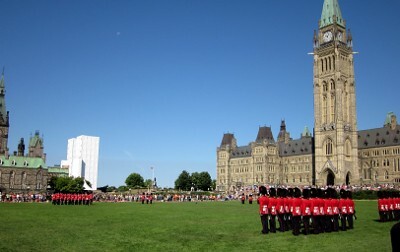 The best spots to view are along the Wellington Street side, closer to the East Block - so you can watch the entrance parade as it comes up the street - or up right in front of the Centre Block, where you can be close to the band and see the entire formation laid out in front of you. Whatever the age of your kids, make sure you leave room for the tower, and the cats, and the running, and the princesses. Now that part of Parliament Hill, I can give a Summer of Awesome Should Do. Lynn is mom to three tombliboos aged 7, 5, and 3, and blogs over at Turtlehead.